It's July and the fresh tomatoes are turning red on the vine almost everywhere. Now is the time to get out all those great tomato recipes that demand the freshest, juiciest tomato flavor found only from real tomatoes, grown on real vines, planted in real dirt, under the real sun. You know, the tomato recipes that you really only make during July, August and September. This tomato pie recipe comes to me from my friend Sally. I love it for dinner with a salad - the warm pie and the crisp, bright salad flavors satisfy without being too much for hot summer days. You just can't go wrong with anything that marries the juicy, ripe tomatoes and a flaky pie crust. Occasionally, I blend different cheeses or toss in whatever herbs are plentiful in my garden. 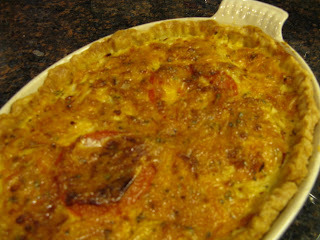 Crispy pie crust, juicy ripe tomatoes, creamy mayo and cheese, sweet onions and savory herbs -- perfect, just perfect! I love summer! Prebake pie shell for 7 minutes at 350 degrees; let cool. Mix mayonnaise, cheese, egg, basil, salt and pepper. Place alternating layers of sliced tomatoes and sliced onions into the cooled pie shell. Spread mayonnaise mixture over the top and spread to the edges to seal. Bake 45 minutes at 350 degrees or until golden brown on top. Cool before slicing. Refrigerate leftovers. Good the next day! 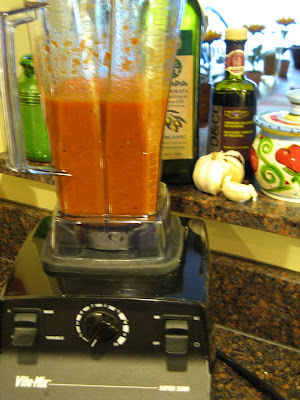 Gazpacho - a soup you can dig into! What could be luckier on a hellishly hot day than finding bits and pieces of vegetables in the fridge to transform into a cool and refreshing dinner? Well, there's only one thing I can think of, and that's having a Vita-Mix blender to whirl all the vegetables into a zesty, refreshing bowl of Gazpacho. I have Joanne Weir to thank for my Vita-Mix. No, she didn't give it to me. I wish! But she did wax poetic about Vita-Mix in a cooking class I took with her once at Ramekins in Sonoma. I flew right home and ordered one. Well, in the interest of full disclosure, I think my husband probably bought it for me. There is nothing better than a Vita-Mix for turning fruits and vegetables into juices, smoothies, sauces or purees. In fact, aside from a good washing, most produce doesn't need more than a rough chunk/chop and then right into the blender container. No nutrients lost in peeling or prepping. Yep, seeds and all. Just put the cover on and whirl away. And clean-up is just as easy. Just rinse and then fill the container with some water and a few drops of liquid dish detergent. Turn it on for a few seconds to remove all evidence that you might be sneaking a few vegetables into dinner. And no pulp to scrape, or puzzle of pieces to take apart and reassemble. Admittedly, a Vita-Mix is an investment, but it is so much more than a blender, or food processer for that matter, that it's worth it. If all you want is a frozen Margarita, then a Vita-Mix may be overkill. But if you want to make baby food, soft foods for special diets, vegan or vegetarian foods, nut butters, sauces, soups, or flours from whole grains for baking, then you'll want a Vita-Mix for years and years of great nutritious food. Gazapacho is one of the special treats of summer--so fast and easy to make with almost any combination of vegetables and tomatoes. I subbed a can of diced tomatoes for fresh ones and left out cucumbers, simply because I didn't have either, and it was too hot to drive to the market. Therefore, the recipe below should serve as inspiration for your own unique blend of available ingredients. But what luck if you do have a Vita-Mix blender to turn whatever vegetables you have into a perfect hot weather meal, before they even lose that soothing, delicious chill from the refrigerator! Note: I don't work for Vita-Mix, or receive any compensation from them. I just love my Vita-Mix! Pour all ingredients into container of Vita-Mix blender and process until reduced to thick liquid; adjust seasonings to taste. Pour into a bowl and top with dollops of yogurt and pesto and serve immediately, or chill before serving. Serves 2 to 4. Cora Cooks Has A New Address! Am I the last person on the planet to remember to change the bookmark link on my toolbar for my own website? OK, maybe not everyone on the planet reads Cora Cooks. Yet. But today, I finally remembered to update my own bookmark toolbar, after absent-mindedly clicking through the Blogger "redirect" reminder a few hundred times! Blogger is very kind to provide the redirect screen for those of us bloggers who are ready to take off the training wheels. But every time I saw that little redirect notice, it made me feel like my site was headed into the lunatic fringe, or something worse, and they couldn't be responsible. And it's simply not true!!!! I'm just setting my site toward the future and the personalized domain name is the beginning. 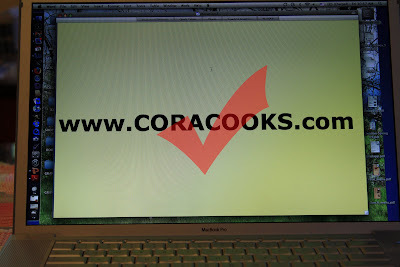 Thanks to all the loyal readers who have already made the move to follow me at Cora Cooks. And welcome to the many, many new readers -- hooray for new readers! -- who have found Cora Cooks over the last few months. Add us to your bookmarks, sign up with your feed reader or sign up for email notices of everything that happens here. I love to hear what you have to say too, so please share your comments about recipes, ingredients, cookbooks, menus, photos, entertaining, gardening -- well, preparing or enjoying anything about good food! Here it is! And it's a good one! Pizza #3 has two of my favorite foods rolled into one -- BLT Pizza! 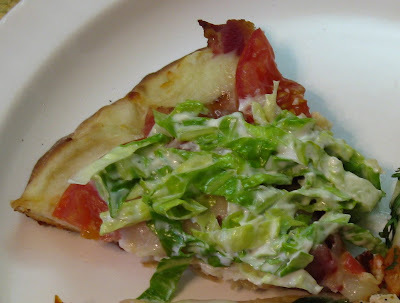 California Pizza Kitchen provided the inspiration for this one -- sliced fresh tomatoes, diced bacon, and shredded mozzarella baked on a crispy crust, then topped with chopped romaine lettuce mixed with a little mayonnaise. The only adaptations we made to the CPK recipe were using Applewood Smoked Bacon and regular tomatoes, which looked better than the Roma tomatoes at the market on the day I shopped for the party. Actually, any good ripe tomatoes, from grape to beefsteak, will work for this pizza. We loved the Applewood Smoked Bacon though, and would definitely use it whenever possible. If you like a crispy, crunchy, creamy, salty, savory, and juicy BLT, then you'll want to give this pizza a try. It's the perfect light and refreshing pizza for summer! Place pizza stone on bottom rack of oven and preheat to 500 degrees. Brush olive oil over the surface of the pre-baked crust. Spread 3/4 cup mozzarella over the oiled crust. Place cooked bacon over the cheese. Place tomato slices over the bacon and top with remaining mozzarella. Bake pizza for 6 - 8 minutes, until cheese is bubbly and crust is golden brown. Remove pizza from oven and slice into pieces. Mix mayonnaise with lettuce and spread over the top of the pizza. Serve immediately. 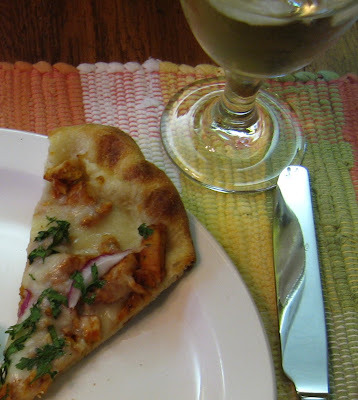 The second new pizza from our recent Gourmet Pizza Night is the gotta-try-this-at-home Barbecue Chicken Pizza. Barbecue sauce may be unconventional, but with the chicken, cheese, onions and cilantro it elevates pizza to something special. The recipe is adapted from the The California Pizza Kitchen Cookbook and it is every bit as good as the version served in their restaurants. Maybe even better! The flavors blend nicely to create a spicy, smokey, sweet, savory pizza sensation. The CPK recipe called for smoked gouda cheese, which I didn't have, but it might just add another appealing flavor layer, so I will look for some next time. Diced leftover chicken would work well here. Just follow the recipe and saute it in the barbecue sauce to infuse the flavor. Try cooking this pizza on the grill for a delicious variation on a theme at your next cookout. Outstanding flavor from a few simple ingredients, prepared in a short amount of time. Good enough for company pizza--the guys will love this one! Place pizza stone on bottom rack of oven and to 500 degrees. In a large frying pan, heat olive oil over medium heat and add chicken. Saute chicken for 5-6 minutes, until just cooked. Add barbecue sauce and continue to cook 1-2 minutes, until sauce coats chicken completely. Spread mozzarella cheese (reserve small amount of cheese for sprinkling on top) over pre-baked pizza crust. Spread chicken pieces over entire pizza. Place onion slices over chicken. Sprinkle reserved mozzarella over top of pizza. Place pizza on stone in oven and bake until crust is browned and cheese is bubbly, about 8-10 minutes. Remove from oven and sprinkle with chopped cilantro before serving. Makes one 10-12 inch pizza. My friends and I made some really, really good pizza last night! Of course we had a couple of classics, like pepperoni and pizza margherita. But the gourmet pizzas were the big stars of the evening. In fact, the three gourmet-at-home pizzas were so good that I can only share them one at a time. Each deserves to be savored and appreciated on its own. You know I'm crazy about thin and crispy crust and I like to make it myself, just to be sure it's perfect. I actually had four crusts in the freezer from last week's brick oven pizza party, which had been pre-baked -- the secret to great pizza at home. With one additional crust made from leftover dough and pre-baked before everyone arrived, we were ready to make five pizzas for the seven of us to sample. This is Linda proudly showing off her pizza -- Salmon Pizza with Tzatziki. It was, quite simply, O-U-T-S-T-A-N-D-I-N-G! The recipe is based on one I found in a wonderful little cookbook, Delicious Pizza (publisher is Paragon Books Ltd, in the UK, but I couldn't find it listed at Amazon or Barnes and Noble - I picked it up at a discount garden center). 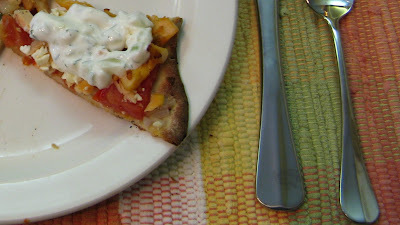 I decided to add some feta to the other toppings and then I adapted Kalyn's delicious Tzatziki recipe for the topping. The result was just perfect. Really! Do I need to say it again? Make this pizza if you like salmon, or feta, or tzatziki. I guarantee you will love it! And if not, I will come to your house and take it off your hands. Preheat oven to 500 degrees. Sprinkle the tomatoes and shallots evenly over the pizza crust, almost to the edge. Break salmon into small pieces with a fork and spread on top of tomatoes and shallots. Top the salmon with diced feta. Bake for 5-10 minutes, until crust begins to brown around the edges. Remove from oven and cool briefly before slicing. Serve with Tzatziki to spoon over pizza. Place diced cucumbers in a strainer or colander and sprinkle with Kosher salt and let stand for 30 minutes to reduce moisture. After draining, press firmly with dry paper towels to blot out moisture. In a bowl, mix yogurt, lemon juice, cucumbers, garlic, dill and freshly ground pepper until well-blended. Check seasoning to know if any more salt is needed. Refrigerate for several hours before serving. Tangy and refreshing served with grilled meats, poultry or fish. *Note: If you can't find Greek (Oikos, made by Stonyfield Farms, is my favorite) yogurt, you will need to strain regular yogurt through a coffee filter for about 30 minutes, to remove some of the liquid. Greek yogurt is much thicker than regular yogurt and makes a much nicer sauce. My birthday/dinner club is coming over tonight to make pizza. The crusts have been prepared and pre-baked - the secret to a crispy crust and making pizza for a group. Here's a list of the ingredients I've gathered. I'll bet you can't guess what kind of pizzas we're going to be making? Here's a hint - we're making five different kinds. I'll post the pictures tomorrow so you can see how our pizzas turn out - and whether or not you guessed correctly! Between the years of 1986-2003, we experienced seven hurricanes where I lived in North Carolina. Even 60 miles from the coast, we had one Category 5, one 4, four 3’s and a 1. The damage was always significant and the clean up was backbreaking, especially in the heat and humidity that always followed the storm. I came to dread June 1st, the official beginning of hurricane season, and only breathed a sigh of relief when November 30th rolled around. Hurricane Floyd, in 1999, was a real doozy for the whole coastal plain region. As luck would have it, we woke up on the wrong side of that hurricane’s rotation and suffered devastating flooding on top of the deadly wind damage. I say we woke up because, in my experience, hurricanes always hit hardest at night. Imagine 10-12 hours of wind and rain like we had here on May 8th. All night long you could hear things breaking, falling, and blowing around, but the extent of the damage was unknown until daylight revealed giant hardwoods and towering pines strewn about like pick-up sticks. After Floyd, I threatened to leave town at the slightest hint of a hurricane forming anywhere in the Atlantic. When we announced to our NC friends that we were moving back to Illinois, one of the most frequent responses was genuine concern for the safety our lives in Tornado Alley. I assured them that I was a Midwest-born-and-bred veteran of many hours spent hunkering-down in my family’s basement, always with a few of our concrete-slab-house neighbors, waiting for tornadoes that fortunately never materialized. I assured them that our new home also had a basement, something most homes in NC’s coastal plain do not! And then I just had to remind them the worst tornado I’d ever known happened just up the road in Raleigh NC! With no hurricanes in the Midwest, I figured we were actually trading down on the dangerous weather phenomenon scale. So with North Carolina fading in my rear view mirror, there were lots of things I knew I would miss during the summer months—the beach, eastern North Carolina barbecue and sweet tea—but definitely not hurricanes! I was certain I had seen my last hurricane as we headed 803 miles inland. I checked hurricanes off my “been there, done that” list. Oh, how wrong I was! The storm we had on May 8th, in our little corner of Southern Illinois, was every bit like those I saw in North Carolina. Forget about calling it a mesoscale convective vortex or a derecho. Let’s not quibble over whether the darn thing formed over land or water! We had hurricane force winds, torrential rain, the telltale circular motion of the weather pattern, and the calm of the eye passing over us. Shingles flew off. Signs blew down. Torrential rain saturated the ground. Trees broke in half or fell flat on houses. So if it walks like a duck, and quacks like a duck . . . then you’d better duck—it’s a hurricane! In fact, about all we missed of a traditional coastal hurricane were the endless days of warnings on The Weather Channel, allowing everyone and his brother the time needed to strip store shelves of milk, bread, jugs of water and batteries. Oh yeah, and we never got to see Jim Cantore in his rain-soaked Weather Channel parka, being blown down Highway 13, while breathlessly broadcasting live for all the world to see. Everyone, that is, except the people actually in the storm, who don’t have electricity to watch TV. Looking back now, I’ll confess there was a warning sign predicting our inland hurricane that I should have been able to read. In fact, that’s sort of what I was going to write about this month anyway. I had been making notes to write about the welcome introduction of sweet tea in Southern Illinois eating establishments over the past year or so. I guess I was so delighted to discover “the house wine of the South” had come this far inland, that I was distracted from the universal truth it foretold. Crazy things happen when the natural order of things is disturbed. You see, I should have known if sweet tea comes to Southern Illinois, could hurricanes be far behind? One thing you learn right away in the heat and humidity of hurricane country is that while iced tea is refreshing, sweet tea has miraculous powers. It’s the perfect beverage to soothe your jangled nerves after the trauma of a big weather event, or a long day of chopping wood. The other thing you need to know is that iced tea can be served two ways—unsweet and sweet. But in the South they just assume you want it sweet, unless you specifically ask for unsweet. When we came back to the Midwest, I had to laugh at my husband always ordering “unsweet” tea in restaurants. He got a funny look every time because he just couldn’t shake the habit of 25 years. Sweet tea is a cornerstone of Southern hospitality. In a place where strangers are greeted as “shug” and “hon” and your mother always tells you to “give me some sugar” when she wants a kiss, and “be sweet” anytime you leave home, you would expect nothing less. The reputations of many fine Southern cooks and popular dining establishments have been made by their special iced tea brew—a clear, dark amber liquid, sweetened to the viscosity of glucose, poured over ice and served with a lemon wedge or a hint of mint. I’ll admit that I’ve missed sweet tea since I left NC. It is just a part of the natural order of southern life. My intention this month was to tell you how to make sweet tea, the real Southern way, just in case you haven’t had the real thing before. The authenticity of the local restaurant versions often falls short, probably because it has been manufactured as sweet tea. There may be as many ways to make it as there are cooks in Carolina, but to be authentic Southern-style sweet tea it must be homemade, the sugar added while the tea is warm, and then poured over lots and lots of ice. And it must be made in small batches with a recipe from someone’s mama or grandmama. That’s the secret! It’s a secret we never knew when I was growing up. In my family, sometime in our teens we graduated from milk to iced tea with our meals. We always added sugar to the glass after it was filled with ice and tea, so it never completely dissolved. In an effort to make it extra sweet, my brothers would fill the glass half full of sugar and then stir and stir. The result was a layer of sugar sludge in the bottom of the glass, which they would eat with a spoon after they finished the tea. Maybe that’s why my mother never served dessert! Can’t you just see that scene playing out long ago in a sultry Southern dining room? Some poor mama cooked all day over a hot stove in sweltering heat and stifling humidity. She spread the table with all manner of Southern comfort food, only to sit down to a cacophony of spoons clattering against tea glasses and fraying her last nerve. She makes a note to herself, and from that day forward, the tea arrives at the table with enough sugar already dissolved in it satisfy every sweet tooth, requiring only the addition of the silent squeeze of a tart lemon to enhance the taste. Eureka! And the rest, as they say, is history. Iced tea, including sweet tea, is regularly served year round in more and more places outside the South. But we are a diverse country and that’s not the only iced beverage we enjoy. Drinks like Chai tea are also popular and fun for a change. We love fruit flavors like lemonade. Some of us enjoy delicious beverages that add some spirits to tea or tea-like mixtures. 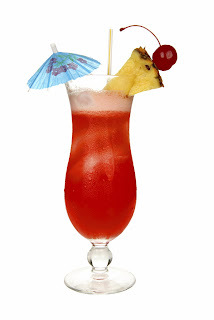 There’s even a “hurricane” you might actually enjoy in this list of recipes for June. Just like everything else, people have their own favorite brands of tea. Across the South, Luzianne is recognized as the favorite for iced tea, but Lipton is the world’s most popular tea and Tetley is also popular. I’m partial to Red Rose tea, either sweet or unsweet. Another one of my favorites is Paradise Tea, which is flavored with passion fruit. I have trouble finding both of my favorites around here, so I order them from Amazon. Whatever your brand, remember tea is also rich in antioxidants, so enjoy drinking to your health anytime, not just when hurricanes blow through Southern Illinois. For us, the storm may be over, but we’ve got enough clean up work to keep us busy all summer. The only thing we need now is some good ol’ North Carolina barbecue. Not that I don’t love Southern Illinois barbecue, because I do, but that Eastern Carolina ‘cue is like no other. And together, sweet tea and barbecue go a long way toward easing the adverse affects of heat, humidity and hurricanes. Thanks to our Southern sisters for sharing the secret restorative powers of their sweet tea. One hurricane is more than enough for us, but we’ll keep the sweet tea flowing. And y’all be sure to send us some of that barbecue next time? Use one regular size teabag per glass of tea, or one family size for three glasses of tea. Add more water after the sugar is dissolved, if it is too strong. Always use fresh water to brew tea and do not refrigerate until tea cools to avoid cloudiness. Tie the teabags together so they will be easy to remove without tearing. Pour the hot water over the teabags and remove from heat to steep – don’t boil the teabags. Don’t squeeze the teabags when removing them – makes the tea taste of bitter. Granulated sugar will not dissolve in a cold glass of iced tea. Add sugar while the tea is still hot or serve tea with a small pitcher of simple syrup. Infuse mint or lemon flavor in simple syrup before it cools. Garnish glasses of tea with lemon cut in wedges instead of circles, because they are easier to squeeze. Freeze lemonade, limeade or orange juice into ice cubes to flavor tea and chill it at the same time. Serve tea in tall glasses or canning jars, poured from a big glass pitcher for a lovely presentation. Place the teabags and baking soda in a 2-cup or larger glass measuring cup or pitcher. Pour the boiling water over the tea. Let steep for 15 minutes and then carefully remove the teabags. Pour the hot tea into a pitcher and add the sugar. Stir until sugar dissolves. Add the cold water and allow to cool completely. Serve over ice, or refrigerate to use later. Garnish with lemon, lime or mint. Makes 2 quarts. Mix water and sugar in a pan and heat just until sugar dissolves. Remove from heat to cool. Store in a jar in the refrigerator to use as a sweetener for tea, lemonade, or iced coffee. Add lemon juice or sprigs of mint while mixture is warm to make flavored simple syrup. Place the tea bags in a 1-gallon container. Add the water. Place the covered container in the sun for 3 to 4 hours. Add lemon juice. Chill and serve over ice with simple syrup to sweeten to taste. Stir all ingredients together and serve over ice in a hurricane glass. Blend all ingredients with crushed ice and pour into large glasses to serve. It's not quite time for really good garden-fresh tomatoes, but tomatoes are on my mind. I love bruschetta served on crispy toasted bread. And I used to buy a jar of prepared bruschetta that was really good. It came from Costco and I bought a couple of jars whenever I visited my friend Kerry in Virginia. So the other day, when I found a similar jar of bruschetta at my local Sam's Club, I couldn't wait to try it. Alas, it was not as good as the brand from Costco. Back to the drawing board! The ingredients are few and the preparation is simple, so when I found myself with an extra loaf of French bread the other day, I decided to make my own bruschetta. Good enough for me and good enough to share. Now I'm just waiting for those really, really good tomatoes from the garden. Grow . . grow . . . grow faster little tomatoes. Preheat oven to 200 degrees. Slice bread into ¼-inch rounds and lay flat on baking sheet. Brush each slice of bread with extra virgin olive oil and sprinkle lightly with garlic salt. Place on center rack of oven and bake for 10-15 minutes until lightly browned. Remove from heat and cool. Bread crisps may be stored in a zip bag. Note: Rub bread slices with a cut clove of garlic, instead of using garlic salt, if desired. Note: Day old or stale bread is perfect for toasting this way.